After seeing that over 125 views to the 5 topics I started do not have any comments yet. Surely one of you viewers must have a question, comment or criticism. Better yet, trivia of your own, to expand every viewers world of hifi from the past, present or future. Some viewer must have built a speaker system from scratch or kit. Built a kit such as a Dynaco or Heathkit? Even those like myself who read Leach's " Double Barrel Amplifier " or " Low Tim Amplifier " in Audio Magazine. The Audio Amateur Magazine had oodles and oodles of kits, projects and modifications. Ampzilla was a kit, I believe, in Popular Electronics, when in it's infancy. Have you ever modified an amplifier, pre-amplifier, speaker system, turntable or arm? I sure would like to read of someone elses experiences. Even if they went up in smoke. Maybe I will sit back and wait for you to contribute to this site for it's betterment. Perhaps this is not what the viewers want, Maybe? Have you attempted / built either of these? I still use these mono amps in my audio system, mated with either an AGI 511A or Adcom GFP565 preamp. Plenty of power to drive any AR speakers from the LST to -9s. Wish I could get my hands on another pair to bi-amp my AR-9s. Last year a few of us discussed our modification / restoration of AR-11s and AR-90s. Hope you were able to find and read these. Thank you Rich for adding to the conversation. I welcome your questions, thank you. My older brother, Don actually built the Low Tim amp and Leach's pre-amp. I still remember his comments about his obtaining parts locally and sometimes buying transistors by the 100 to try to get matching specs. He went to several wholesalers at the time as each one chooses which brands to carry. My brother is, what you would call, a particularly fussy person to be polite. I only saw his finished amp and pre-amp about 10 years ago. He took the case covers off and it was a sight for sore eyes. I think even Marshall would be please to see the care that Don took in fabricating and laying out of the various heat sinks and components. I'm afraid I have no reference to compare the sound to. I would say I had a smile on my face and a slight discomfort to my stomach from an Enya CD cut. It was not particularly loud but definitely a smile factor. For those of you who do not know about the Leach amp or pre-amp. W.Marshall Leach Jr. has a web site which has a downloadable pre-amp and Low Tim and The Double Barrel Amplifier. These were as printed in Audio Magazine back in mid '70's with photos. Some of the information has been modified and updated as different items have been discontinued or re-vised. He has other tid-bits for you as well such as a stepped volume control, and other interests. There is, Marshall is quite a nice man, numerous helpful links and helpful photos. Marshall has a bibliography of himself and I must admit that it takes a very dedicated man with his workload to keep this site available for free. He must be a very kind and generous man. I urge you all to visit his site and send him a compliment if you wish. As to whether I built the amplifier, not yet. My interest in hifi took a 20 or so year hiatus. I became a hifi addict again about the mid '90's. My bother gave my the article for the Double Barrel amplifier about then. My notes are still packed so I am trying to scrounge up from my withering brain so I can't at this time give more details. I wrote to the transformer company, which is still in business, and I'm sure on the net. The transformer Marshall spec'd is now called special order and adds a premium of $50.00 US to the $200.00 +/- ( ? ) price plus s&h plus I'm sure something else ( there always is ). Anyways I think it was going to cost me somewhere around $400 - 500.00 cdn 10 years ago. It weighs like 35 pounds. The Double Barrel article was actually a mono amp. Marshall explains this on his site more clearly. I ended up ordering a Torroidal from Plitron in Canada. It was years after my brother built his and parts were almost impossible for me to find locally. We had for example, Active Electronics, which had a few torroidal transformers but old stock. These were the only ones I ever saw in Vancouver. Not popular and expensive I don't know which? Possibly this is not a " kit building from scratch world " now and there is not a profitable market. Electrosonic had a local warehouse with lots of stock, great staff and would bring in orders from their easter warehouse at no extra charge in a week or two. I ordered the 4 Wakefield heatsinks at $40.00 ++ cdn each. The 100 Volt capacitors were Mallory at about $20 - 30.00 +/- each. They were no longer selling Motorola transistors and there again I went hunting locally. Marshall spec'd a particular socket for mounting the power transistors ( Augaut with gold plated pins )and I came across them in an Allied catalog at $3.65 US each and ordered more than enough. The cost plus the exchange rate, plus Fed-ex charge, plus their customs clearance charge plus I think there may have been duty and GST. I've had many more difficulties getting parts as Electrosonics pulled out of here with their warehouse and now there is a shipping and handling charge each order as is Active. I am still acquiring parts and just about have everything or it's current equivalent. If you go to Marshall's site you will see The Double Barrel is really now called the " Super Amp " with a different circuit board layout and other changes. Marshall added several mods since the original article in Audio Magazine. Do go there if you are interested. I will continue on another time with this ongoing saga. Thank you again for leaving feedback. >Have you attempted / built either of these? >pair of Leach Super Amp "kits" as a gift. Total "assembly"
>amounted to securing the walnut side pieces to the chassis. >hands on another pair to bi-amp my AR-9s. I have mounted the output transistors on the heatsinks using the Augat sockets. I should mention that in Vancouver I could only find junky old oxidized surplus or poor quality, new, off shore power To-3 transistor sockets. I was able to find one Augat in a surplus store for $1.75 cdn. The Augat sockets are like a jewell. If you have one, look at the portion that goes through the moulded hole in it's body. There is a small tab bent out to hold the connector into the body. If you have a small screwdriver, very little effort and only a small amount of movement, the tab can be straightened just slightly and it will now fall out into your hand. Anyways if you read his original Double Barrel article, he commented on how thick the heat sink was and just soldered the wire to the transistor lead rather than to the pin eyelet. Now you can slide it onto the transistor lead almost another 1/4" eliminating Marshall's first concern. Obviously the leads must be anchored so that the leads cannot be pulled out after the fact pulling out the pin. Wrapping the wires with backpacking thread or zap straps will keep all the leads from moving. I also used Deoxit on the contacts. I'll leave my stuff for now and turn to your stuff. More precisely the Amps your most wonderful, kind, sweet and very understanding wife bought for you. I have seen one old magazine list amps and some basic specs and I remember Leach's was one or two of the ones listed. I have never seen one and I know nothing more about them. Could you please expand our knowledge about them and anything else you care to..
Would it be possible for you to take some photos of the amps and notify Mark first about these and perhaps we could have them posted. It doesn't sound like much of a kit project for you but your wife sure has great taste. How did she arrive at the decision to buy them for you? Do you know the spec's, for example, was it a Double Barrel version or Low Tim version or other. The Double Barrel was, if I remember correctly was capable of putting out 380 watt peaks. Almost indestructable when the safety circuit was kept in the amp and a bed post pinched and shorted the speaker leads. Marshall's site has lots of reading material. Load up paper in your printer and be prepared to download. From some of the ebay photos I have seen, and I often compliment the photographer, when I see especially excellent up close and personnal photos of speaker drivers or amps etc.. I would not ask for you to send a copy of your documentation to Mark as this might not be ok..
Maybe Mark could ask W. Marshall Leach Jr for permission to print it. Marshall may welcome this. I sure would. We'll see. The Double Barrel Amp is a, build from scratch, project. You must go to Marshall's site and read Part 1 of the article before even considering tackling a major project of this size and at today's prices. The transformer is basic 35# plus crating each. Several people could go together and make a group purchase. The price dropped if you ordered, I think 3 or more. Read Marshall's Part 1 and Part2 article first. The transformer will do for a stereo amplifier, it was just too small a cabinet for him to add the other channel components. It may be possible that 3 channels can be powered by this amp. A nice note to Marshall may bring forth his commentary. He is a professor and is very busy so don't pester him too much. The Double Barrel amp was the name given to the project by, I believe the editor of Audio magazine. 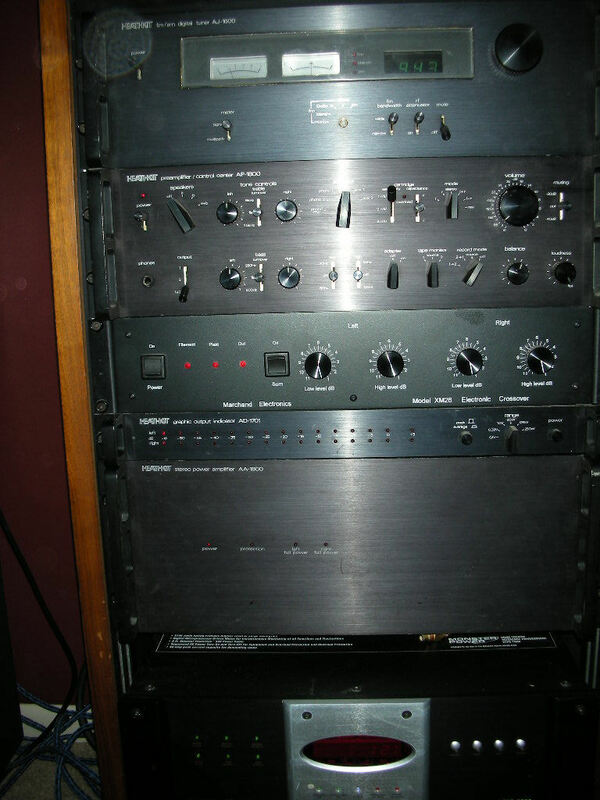 It is a mono amp, not stereo in the original article. He has updated the circuitry and a new main board with more stability, and less chance of parasitic damage. Read how long he worked on developing his amp and at that time he anticipated at least 4 months for you to find all the parts. I will see if I can draw my brother into adding his three cents worth about his Leach amp and pre-amp projects. He is quite busy but who knows. >explains this on his site more clearly. >I ended up ordering a Torroidal from Plitron in Canada @ $222.00 each. >may have been duty and GST. >since the original article in Audio Magazine. >Do go there if you are interested.
" ongoing saga part three ". Rich you have started something really wonderful here , thank you. Continuation of the " ongoing hifi saga part three "
I am sure someone out there viewing this site would be better able to answer this question than I.
stability, and less chance of parasitic damage. Marshall added 10 ohm resistors to the original to eliminate parasitic problems. If you remember the Dyna 416 this was a Dyna 400 with LED's, double output transistors. About this same time period someone discovered a parasitic problem, if I remember correctly due to the long leads of the output transitors. The resistors were added to eliminate this problem and I believe the Leach and Dyna 416 used this same technique. I don't know who get's credit for that discovery but it was an important problem. With the loss of certain parts availablity and also by user feedback I'm sure, the circuit is slightly different but very much improved since the original articles. Read also the Low Tim amp article, it's a predessesor of the Double Barrel or Super Amp. If you look at the schematics it is very similar to the Double Dyna versus the Dyna 400 with more output transistors. I am very pleased to see Marshall support such a project and if you go and take a look for yourself you will be amazed at the history of this one man. The Leach pre-amp article is also well worth reviewing. There were many modifications in its infancy and Marshall kept users up to date with the modifications. I am not an engineer, or scientist, just a hifi buff that enjoys a variety of music when the mood arises. My curiosity is of the effect of the resistors at least those that have tinned steel leads rather than tinned copper. Do some capitors also have steel leads? What, if any affect is there in the sound of music? I have seen resistors for sale in high end mags for a few dollars each. In my quest for " perfect audio " should I be buying several hundred dollars worth of resistors and capacitors and changing also the wires? Capacitor changes in tweeter and mid-range driver circuits are audible, so I've read. Seems to be quite a market for high end caps and coils in crossovers today. I don't feel so inclined to investigate as my hearing is not what it used to be and I don't know that I would hear any difference. Judging by the number of copycats over the years, the Acoustic Research AR-LST's speaker system certainly were and are a much desired speaker.
" ongoing hifi saga part four ". Rich you have really started something wonderful here, thank you again. 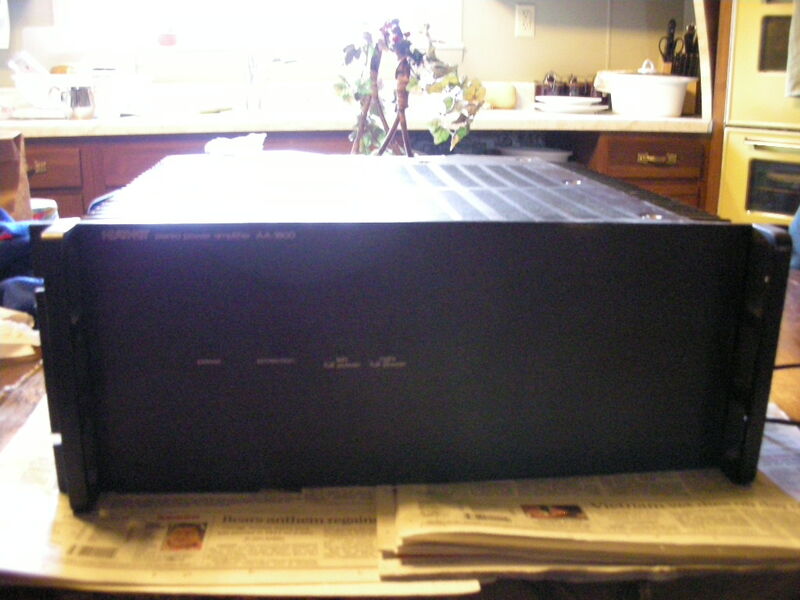 Continuation of the " ongoing hifi saga part four "
Just a side note to this article, the transformer spec'd was a standard power transformer except it weighed about 35 pounds plus about 10 pounds of packing material. The article went on to say there was no transient thump on turn-on whereas with the torroidal transformer there is or can be one humongous thump or transient. I'm sure someone viewing can better explain this phenominum. The difference, as I understand it is, the output of a torroidal doesn't go into such a extra output when a tremndous draw comes along. So, as in the Leach amp article Marshall goes into an explanation that increasing the caps in the power supply won't be benefited by doubling or tripling the capacitance. There again there is someone out there who may be better able to answer this statement. I have never weighed a Dyna 400 transformer but it's up around 20 - 25 pounds +/-. The Dyna transformer was over sized for it's use, as I understand it. Perhaps today it might have been used for a 7.1 receiver. Who knows? What little I see of new equipment they all seem to have torroidals. I believe Dynaco was conservative in their engineering. enjoys a variety of music when the mood arises.
" ongoing hifi saga part five ". Please be patient. I am in the middle of a home renovation project I started this summer, that I must finish soon and before I can spend any amount of time on audio. Dr Leach literally “wrote the book” on electroacoustics and audio amplifier design. This is the text for at least one of his Audio Engineering courses at Georgia Tech. Since your brother built the Leach Amp (Low TIM amplifier) he would be a valuable resource on building either amp from scratch as they are of similar design. Do a search on “Leach” and limit your search to “Solid State” under amplifiers and you will be overwhelmed with discussion threads where the Leach amp is mentioned. There are several threads that specifically discuss building Leach amps, and include pictures of completed projects. You can spend many hours reading these discussions and gaining valuable information from them. By the way, there is also a trading post where you might find some or all of the parts you are looking for. I’ve located all the information I have on the Leach Superamp. (This is the Double Barreled Amplifier, nicknamed by Gene Pitts, editor of Audio Magazine.) As time permits, I will compose a post that lists the specs and other interesting information. I do not have a digital camera – yet. Here is a list of the Leach Super Amp Specs from a LSR&D Inc. product sheet. LSR&D Inc. is the company that engineered and produced the Leach amps. Total Harmonic Distortion: Less than 0.05%, measured at 300 watts into 8 Ohms at 1000 Hz, decreasing at lower levels. *Note that almost all the AR 12 inch speakers are 4 Ohm impedance speakers. The LST has a variable impedance depending on the position of the spectral balance switch. First off, I wish to let the viewers know that when I am responding to Rich, I am really talking to you all and that includes viewers in Europe. I was really surprised when I left a comment in one trivia and a thank you came back from Europe. If you are a viewer from other than North America please say hello. Or just say hello from wherever you are. Thank you for the specifications of your Leach amp. It sure sounds like a well built, quality amp. It so of rings of " Double Barrel ". At least the power output. A schematic would be interesting to see if there is a similarity with the " Double Barrel " or " Low Tim " or an improved " Double Barrel ". >Here is a list of the Leach Super Amp Specs from a LSR&D Inc.
>watts into 8 Ohms at 1000 Hz, decreasing at lower levels. >on the position of the spectral balance switch. I needed some mental therapy and typing practice 5 - 6 years or more ago and I typed out both parts of the Double Barrel article in a Word doc. I assembled quite a few Dynaco kits and Heathkits years ago. I created several different versions of the original Double Barrel articles as if it was being made into a owners manual available for a kit builder. It included tips and other helpful comments. I definitely did not do as good of a job as Heath or Dyna in my writing skills but I had fun. The files were getting larger but I didn't scan the mag photos so they weren't as large as they could have been. My typing skills didn't improve very much but I sure knew more about the amp article for sure. I have the original mags with the Double Barrel articles and have had them photocopied and in colour in cases of the coloured pages. I don't usually photocopy magazines but I find a lot of my Dynaco large schematics, especially in colour, tend to tear at the folds. Even the Audio magazine tends to tear at the binding. I wanted to preserve the images at least as long as I own the originals. When I was handed the copies and the originals back of the large Dyna schematics, I just about freaked. They had rolled the new copies up instead of folding them. I learned something new that day about paper and creasing. Roll up large sheets and keep them in a large plastic tube is one way to preserve them. I use a large cardboard box that is about the size of a wall painting, and just left them flat. This inside experience may help you preserve similar sheets. We do need to preserve our historical documents for future generations. Dynaco and HeathKit documents, just to name two, should be kept for our children or grand children. To be able to read and look back at our antiquainted hifi equipment, as we may now look back at tube equipment pre stereo. Rich you have been very helpful contributing with your input to this topic. I do hope you, when you have more free time, that you may add your photos, copy of your spec sheet, listening commentary, or construction comments of your Leach amplifier. I'm sure this will encourage other " Leach " fans to write their thoughts as well. I'm not suggesting restricting this to just Leach products but Dyna or ? There must be other viewers, or friends of viewers who assembled or attempted to assemble a " Leach " amp or pre-amp or volume control. Somehow, I missed this thread when it was current, perhaps it's not to late. I own two amps that are derived from the Leach Super amp and have been using them for quite a few years. I built one sometime around 1981 while in the Navy and other than repairs due to my local power company, it has worked flawlessly. I picked up a second amp a few years ago on Ebay knowing it was dead, had it repaired and it's worked equally well. The amp I'm referring to is the Heathkit AA-1800, which was one of the last amps the company designed before getting out of the kit business. As for modifications, I've done very little other than upgrade RCA jacks and replace green wire. This weekend tho, I'll do a bit more. There's a single 10uf coupling cap per channel that I intend to replace with a poly cap. I've started to notice the high end rolling off a bit and this cap is a likely culprit. 26 year old electrolytics generally are a bit past their prime. I am not familiar with the Heath amps you are refering to unfortunately. Would be nice to know more about them. Visits every so often to W Marshall Leach's website is most enjoyable. I picked up a Leach partial amp off ebay a year ago, I wrote to Marshall a few times about it. I'll post a few photos of the amp and its internals when I replace the caps. Thanks to our podunk post office, the caps have yet to arrive in spite of the fact USPS tracking says they arrived at the post office last Thursday at 2:30PM. Edelstein is not the center of the universe having an official population under 500 and being over 30 miles from anywhere considered relatively important. Looking forward to the photos, thank you. The task is done, I've replaced the 26 year old NP electrolytic coupling caps with poly caps. I'll not win an award for this mod, but it works, is safe, the solder joints are sound and it achieved what I hoped it would. The track that made me aware there was a problem is "In God's Country" from U2's album, "The Joshua Tree". A background guitar was missing that sounds similar to a violin simply vanished. The surgery restored the missing instrument. Other effects are more subtle. The high frequency seems to be quite a bit clearer, with massively improved harmonics and the bass definitely is tighter with excellent definition. Simply put, it was worth the $14 I paid Parts Express. If possible could you please take one more of the front with more light behind you please. There certainly is a lot of heatsink on that chassis. The nice part is you paid only such a small sum of money and had some enjoyment doing it. Here's a better photo of the front. It's back in the rack with everything else now as you can see. There are four LEDs on the front of the unit: Power, Protection, right and left full power which come on somewhere around 500 watts. Can you please go down the list what is in your rack, please. Quite a setup you have. I may be too late but is it possible to show more inner detail of the amp. I love the circuit boards and wiring details. Did you assemble it from a kit? 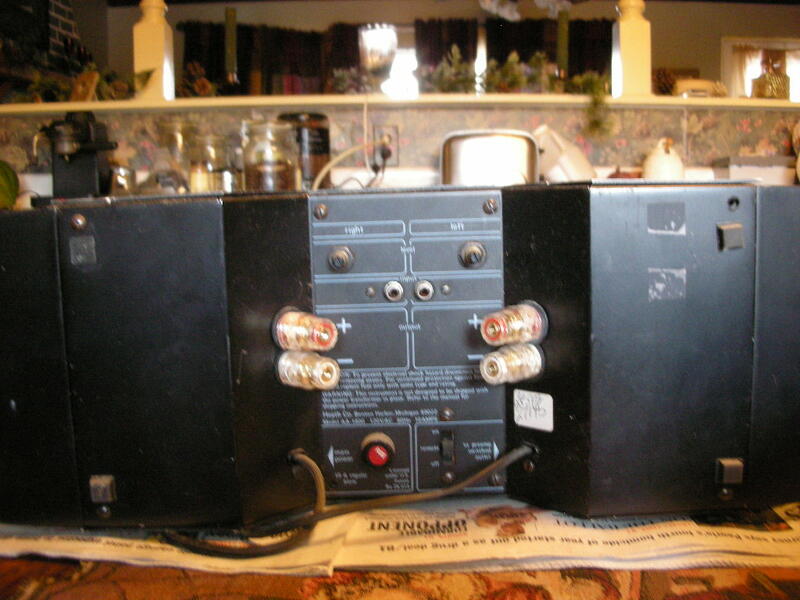 The tuner is a Heathkit AJ-1600, with the optional Dolby FM module. Next piece is a Marchan XM26 tube crossover, which uses 8 12AX7 tubes. The piece immediately over the amp with the row of lights is an AD-1701 power output indicator. And the bottom unit is the Heathkit AA-1800. This amp BTW is wired to drive the upper half of my AR90's with an identical amp dedicated to the woofers. I personally built every item in the photo, the Heathkit items in the very early 80's while in the US Navy and stationed on the USS McCandless. The amp had a free ride over to Europe, thru the Med and back home before finally being shipped air freight back to the Midwest. I've suspected this "might" be why some of the audio wire in it turned green. I assembled the Marchand crossover a few years ago in about a week. It's a relatively straight forward kit to build, but I do not suggest it for a beginner kit builder. On the other hand, Marchand absolutely guarantees success and is extremely easy to reach via phone, and Phil Marchand himself answers it. Unfortunately, with the units being rack mounted, it's not exactly a simple task to remove the amp once its installed. This is not a lightweight puppy to manhandle. I should add that it's darn near impossible to take a photo of the component side of the circuit boards as the components face the back of those massive heat sinks. Many years ago, I heard an incredble BANG come from the amp but it kept playing. I pulled it out of the rack, pulled off the covers and searched for damage and was about to write it off as my imagination when I discovered dust left over from a ceramic cap exploding. With the help of a mirror, I finally discovered it was a cap burried between a smaller, U shaped heatsink bolted to the main heatsink. May it never blow up again. I still have the original manuals and schematics for every piece. Thank you for the overview. I built lot's of Dynakits and a few Heathkits. After all was said and done, I always felt that there was more feeling of accomplishment when a Heath project was completed. I guess having to do everything with the Heath, including part's placement, was part of that feeling. Heath had a super amp that was well liked but I guess being a kit and price kept it from the masses. They did have AR-15 and it's separates, which my big bros had owned, and the AR-1500, which big bros had owned as well, and it's separates. The old heathkit manuals were written with a rank amateur in mind; I remember one of the first kits I evr assembled even came with practice pieces to solder together. Still, from what I've read, Heathkit was constantly amazed how creative people could be in misinterpreting their instructions. The single example I can remember was their instructions to put spaghetti on bare wires. most of us realize spaghetti is a hollow wire insulator you slip over a bare wire. They actually had a kit returned for repair by a novice kit builder that had gone to the trouble of boiling real spaghetti, slipping ot over the bare wires and assembling the kit. I never had the privelage of assembling a Dynakit, but the units I stumble across today are highly reminiscent of the Heathkits then available. If you look at photo "1923.jpg" in a previous message, notice the inside of the left and right heatsinks, it's a bit clearer on the right side of the photo. In the bottom right, you can see a gray electrolytic cap and another in the upper right corner. That's where the guts are for each channel making it impossible to photograph with dissassembling the channel. Physically, this is two separate mono amps attached to a single power supply. Rail voltage is a positive and negative 200 VDC, each rail of each channel fused with a 5 amp fast blow fuse and two 1/64 amp fuses on the audio input. Even with the soft start circuit, the amp can easily draw an 8 amp surge and it's normal for the room lights to momentarily dim when its turned on. Heavy bass at high volumn can easily cause your room lights to flicker to the music if you house wiring is lacking. 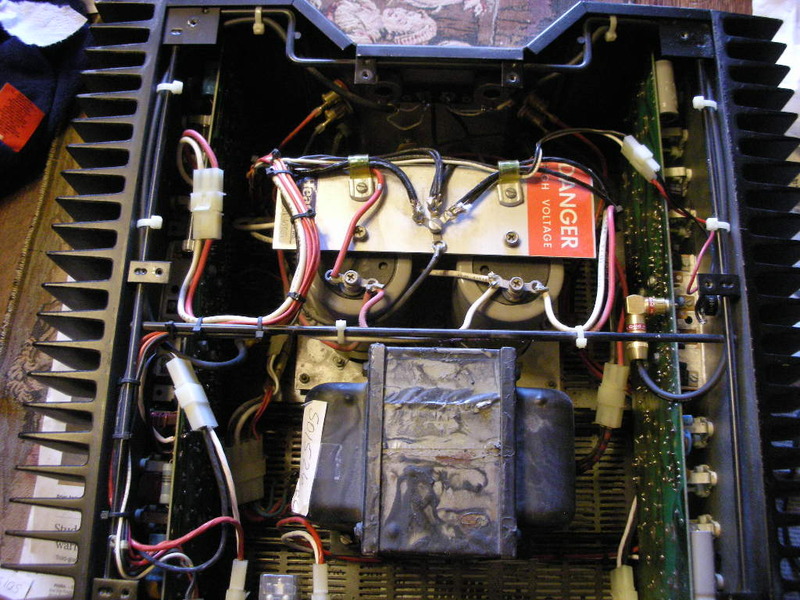 If you look super close at the wiring harness, you will notice the nylon wire ties. That's the only semi obvious evidence I rebuild the wiring harnesses. I did consider using an original type of coated string but had a stroke of sanity and used the wire ties instead. Sorry, I just saw this older posting, thank you. Thank's for all of your description and photos of your Leach amp. I built quite a few Heathkit and Dynakits back in the '60's and early '70's. The Dynakits were not anywhere near the finished product, in appearance only, compared to the Heathkits. The final appearance, of course, depended on the care and skill of the assembler. The Dynakits parts layout that were factory assembled on the earlier kit boards were, messy at best. There was a visual improvement with the later fiberglas boards. The wiring was the most difficult part of assembling a Dynakit. If you were really neat you could have a nice finished kit. With the Heath, you could orient the parts in an organized layout. Also with care and skill these Heathkits looked really supperior in appearance. Hifi wise, the Dynaco kits, ran circles around most readily available hifi equipment on the market, for up to maybe 2 and 3 times the price of the kits. 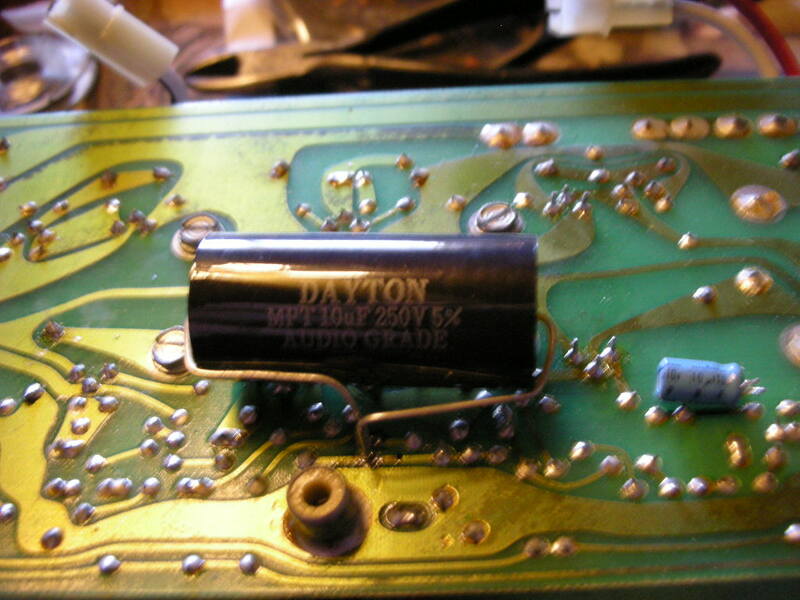 A few pieces of Heathkits gained success as superior audio component, but never the overall success of Dynaco. I feel that being a more complex kit held back their being more readily accepted. This is 12 days after my posting, I wanted to see when the editing feature expires.